On April 25, 2018, the Fraunhofer FOKUS business unit FAME held two lectures on its solutions “Dynamic Ad-Insertion” and “HbbTV Measurement and Research Tool” at the “Media Innovation Plattform” organized by Deutsche TV-Plattform. At the Media Innovation Plattform in Hamburg the latest technologies and developments concerning the topic smart media were discussed. Within the framework of the panel “Addressable TV: Personalisierte Inhalte und Zielgruppenoptimierte Werbung“, Dr. Stefan Arbanowski from Fraunhofer FOKUS presented the solution “Dynamic Ad-Insertion” developed by the business unit FAME. The “HbbTV Measurement and Research Tool”, also created by FAME, was introduced by Robert Seeliger. 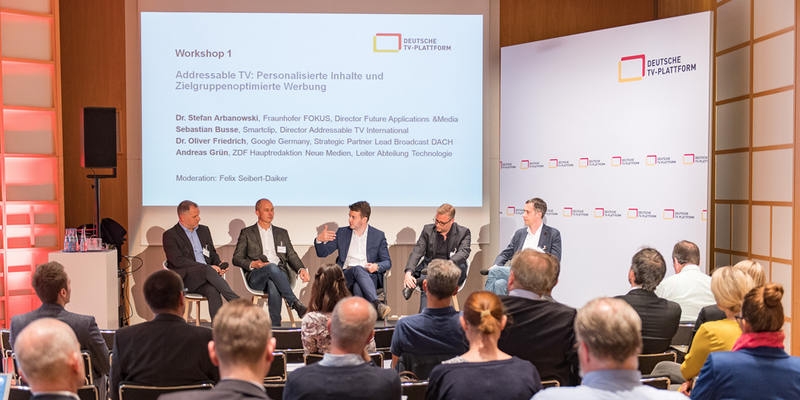 As a result of the event there is a general consensus: Individual and personalized advertising is the future of Live TV and will be available to a broad mass audience thanks to HbbTV 2.0. The measuring technologies and ad-insertion solutions of Fraunhofer FOKUS help to transform that vision into reality.